Jain Temple, dedicated to Shri Dharmanath, the 15th Jain Tirthankar, is another religious institution of Mattancherry. Built in 1960, the temple complex is sprawled over a large area with various blocks constructed for prayers and as places for offerings. 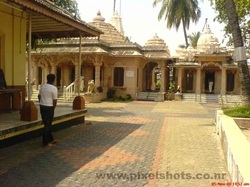 The architecture of the temple is inspired by the Jain temples of Gujarat.